C.BIO is a casual organic shop that sells fresh organic produce, prepared meals, raw meats, pastries, breads, desserts, jams, and beverages, etc. along with other organic non-food products. As soon as customers walk into the establishment they enter an extremely comfortable in the atmosphere. Everything is clean and organized but it gives off a sort of rustic vibe. The staff is extremely helpful in explaining the foods and giving their recommendations. The shop is organized with the produce and other grocery items taking up most of the store accompanied by a counter for baked goods and a counter for prepared meals. 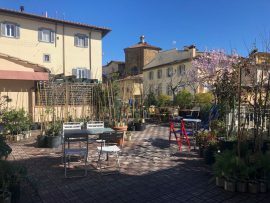 The food is a very reasonable price considering the quality, but still more expensive than some other lunch cafés available in Florence. However, the quality is worth the price. It was also nice because the shop is not overwhelmingly busy as other markets can be. The unique and featured aspect of C.BIO is their upstairs terrace. There customers will find outside seating on a terrace surrounded by plants and herbs for sale with direct sunlight. It is perfect for enjoying a quick lunch with friends on a nice day, or for doing some homework as they provide you with the Wi-Fi password clearly as you walk upstairs. The tables are small so it may not be suited for large groups of people. There is also no need for a reservation because this is an organic shop first and foremost, with seats for those who want them. It is important to know that when English-speaking customers order their food, everything is listed in Italian with no English labels, but there is an English menu available if you ask for it. Open from 8:30 in the morning to 20:30, Monday through Saturday, it is available to people with all different schedules. Overall, C.BIO is the perfect place anyone looking for a casual market/lunch café with that is comfortable with slightly above average prices for quality, delicious, organic food. This entry was posted on Friday, April 5th, 2019 at 9:32 am. It is filed under Florentine Foodie. You can follow any responses to this entry through the RSS 2.0 feed.